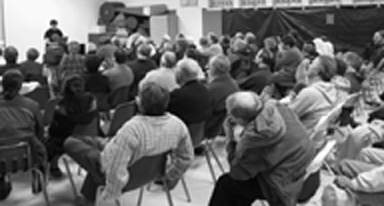 On February 7, 2004, the San Jose Astronomical Association hosted its best turnout ever with a count of 106 people who attended to hear Dr. Alexei Filippenko (UC Berkeley) discuss "Einstein's Biggest Blunder? The Case for Cosmic Antigravity." He talked for 90 minutes, took questions in a formal Q/A for 45 minutes and continued discussing various astronomical topics in an informal session for at least another 45 minutes. As they say on the radio station, the hits just keep coming. In March our speaker will be Don Machholz. Don was a major force in the SJAA before relocating to the darker skies of Colfax, CA. He is a discoverer of 9 comets that bear his name and he is one of the originators of the Messier Marathon - the annual attempt to see the entire Messier list in a single night. From 1988 to 2000 he was the Comets Recorder for the Association of Lunar and Planetary Recorders. His talk will cover the history of the Messier Marathon. This talk will be on March 6 at 8 p.m. at Houge Park. Later in the month, this year's Messier Marathon will commence at Coe State Park on March 20. More details are on Page 6 of the February Ephemeris. Then, coming in April, the annual SJAA Auction is on Sunday, April 4. There are more details about the auction in Jim Van Nuland's article on page 3. Leading all of these activities is the board of directors. At the February meeting the following candidates were reelected: David Smith, Steve Nelson, Gary Mitchell and Mike Koop. The following directors have an additional year to serve: Dana Crom, Jim Van Nuland, Craig and Elana Scull, Bill O'Shaughnessy and Bob Havner. At the March meeting the new Board will elect its officers for one-year terms. Officers are chosen from the Board. Board meetings are held at 6:30 p.m. preceding each general meeting. They are open to all.